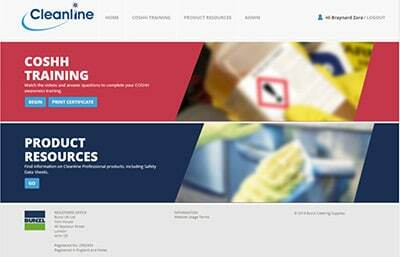 The Cleanline e-learning website has been re-branded and re-launched, providing up-to-date COSHH awareness training in line with the current classification, labelling, and packaging regulation (CLP) and an expanded product resource section – now providing advice and safety information on over 46 Cleanline cleaning products. The CLP regulation ensures that the hazards presented by chemicals (including cleaning products) are clearly communicated to workers and consumers in the European Union through classification and labelling of chemicals. 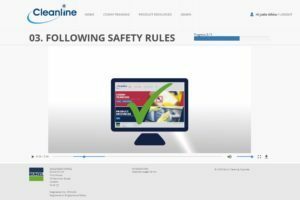 Originally launched in 2015, the Cleanline e-learning website has been helping catering operators safeguard their employees with free, online COSHH awareness training for over 3 years. The website has over 3,749 registered users and has helped over 2,332 employees become COSHH aware. Providing up-to-date COSHH awareness training to individual employees in less than 15 minutes, via five engaging video modules, successful completion of the five modules is rewarded by way of a certificate and automatically flagged to the operator administrator, who can see which employees have completed the training, together with the date they last completed it. The beauty for operators is that they can provide refresher COSHH awareness training for employees, whilst also making it an integral part of the induction process – ensuring new staff members are COSHH aware even before they’ve stepped on site and reducing the risks associated with on-the-job training. Paul Willcocks, Commercial Director, Bunzl Catering Supplies comments: “Our free, online resource from exclusive brand Cleanline, has become an important part of many of our customers on-boarding and safety training processes around the safe use of cleaning products in their operation. The reporting functionality on the Cleanline e-learning website has also been enhanced to ensure operator administrators have better visibility on who’s completed their training across multiple sites. Operators requiring further information or a live demonstration of the Cleanline e-learning website can email rod.hale@bunzl.co.uk or call 01372 736 300.